The British pound is holding onto its earlier gains as markets hold their breaths ahead of Thursday’s Brexit vote. The currency is up by 0.2% at 1.4689 against the dollar as of 7:23 a.m. ET — just below its highest levels this year. “The upside momentum has faded, and a consolidative tone has emerged,” Marc Chandler, the global head of currency strategy at Brown Brothers Harriman, wrote in a note to clients. The euro is stronger by 0.4% at 1.1288 against the dollar after falling on Tuesday on the back of Mario Draghi’s comments that there could be more stimulus. Inflation dynamics are still “rather subdued” even as the economic recovery “gained momentum at the start of the year,” he said, according to Bloomberg. 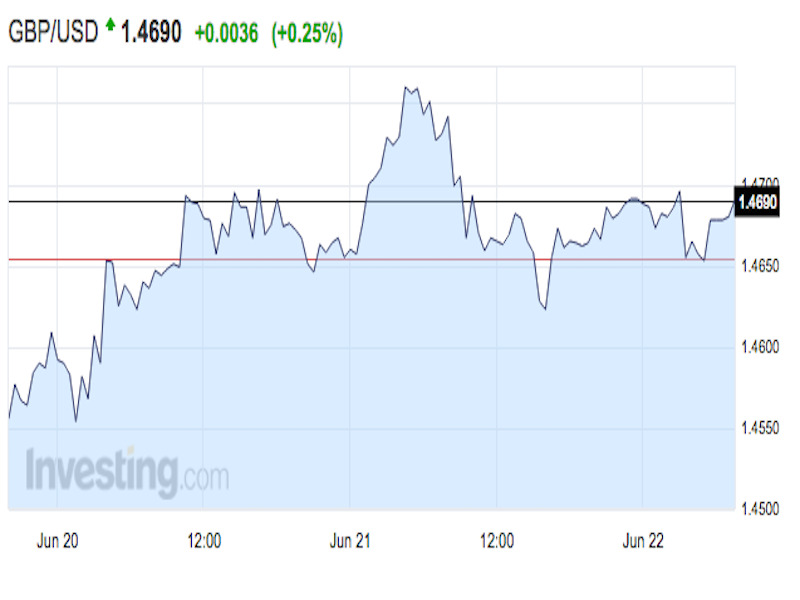 The Australian dollar is stronger by 0.6% at .7496 per dollar after a tospy-turvy day. In early European trade, the currency briefly traded as high as .7512, before dipping back down. “The catalyst for the decline was broad-based US dollar strength, something that came on the back of caution before this Thursday’s UK Brexit vote and an appearance by US Federal Reserve chair Janet Yellen before the US Senate banking committee,” noted Business Insider Australia’s David Scutt. The US dollar index is weaker by 0.3% at 93.78 ahead of FHFA Housing Price Index and existing home sales data, which will cross the wires at 9 a.m. ET and 10 a.m. ET, respectively. The Thai baht ended little changed at 35.24 per dollar after the Bank of Thailand kept policy on hold at 1.50%, as expected. The Japanese yen is little changed at 104.62 per dollar.